More than 15,000 students grades K-12 from 25 states and 45 countries are slated to compete in the global FIRST Championship in Detroit this week (April 25-28), spending an estimated $30 million in the city. 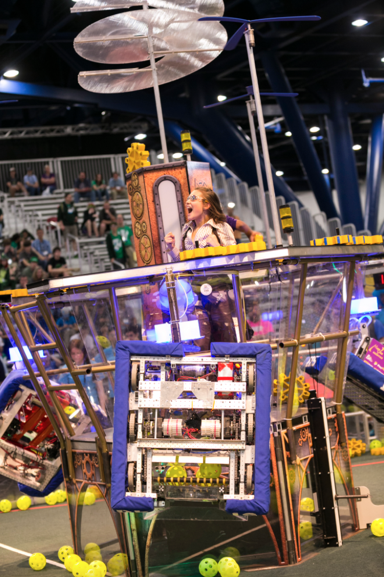 The competition, to be held at Cobo Center and Ford Field, is the culmination of student teams that made custom robots and participated in regional robotics competitions around the world. The event is open to the general public. “When you add friends, parents, mentors, coaches, and sponsors, more than 40,000 visitors will be in Detroit over the next several days who will generate an estimated $30 million in direct spending to the Detroit area economy,” says Larry Alexander, president and CEO of the Detroit Metro Convention and Visitors Bureau. This year marks the first of a three-year commitment that FIRST Robotics made to hold the competition in Detroit. It was booked in 2015 by the bureau, and preparations have been underway for two years. As part of hosting the event, customized messaging will wrap the Detroit People Mover; more than 100 volunteers will welcome visitors at Detroit Metro Airport and in the city; there will be welcome desks, welcome banners, and information available at regional hotels; and FIRST Robotics visitors will receive discounts at more than 40 downtown establishments. Click here for more information and a complete schedule. For a recent DBusiness magazine article about FIRST Robotics in Detroit, click here. The Detroit Metro Convention and Visitors Bureau is a private nonprofit that markets and sells metro Detroit as a major destination on a worldwide basis. More than 700 businesses are represented in the bureau’s membership. It was founded in 1896, and is the world’s first convention and visitors bureau.